Oh the Rottweiler, such a wonderful breed of dog, sometimes so misunderstood. When you know, and live with, the breed you will soon learn that he is not all guard dog. The Rotty is loving, friendly and despite his size the basic and fundamental part of the Rottweiler temperament is love. The Rottweiler originated in Germany. They were a multi­faceted herding dog which was also used for stock protection. They are a very intelligent breed, and they are very protective by nature. They were believed to be descendants of ancient Roman drover­dogs, and were known for being rugged and dependable dogs that had great guarding instincts. The Rotty ancestor soon became a well known guard, particularly for the travelling butcher, he guarded the meat, money and even the butcher himself from potential thieves. This is when the Rottweiler got their first name, the Rottweil Metzgerhund, or Butcher’s Dog. Rottweil is a town in Germany where the Rottweiler first became utilized by the Germans. Eventually the Butcher’s Dog became known simply as the Rottweiler. The Rottweiler is a strong, obedient, confident breed of dog. They are very loyal and willing to please and are completely versatile. They can qualify for many different types of jobs. They are not just great dogs for herding and guarding, which they are most widely known for, but also are great for police dogs, search and rescue dogs, and guide dogs for the blind or disabled. 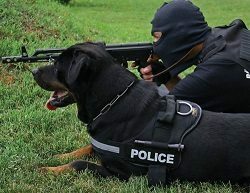 Their intelligence and good natured disposition makes them a great dog who can handle just about any job you give them. The Rottweiler is known for having a gentle disposition. He loves people and when bred properly he will make a great and gentle companion. The kindness in the nature of this breed makes him an all-round caring dog that will protect his family with devotion if he sees the need. The Rottweiler is undoubtedly powerful and if defending himself he can cause damage, which is exactly why the breed needs to be well socialized, cared for and bred responsibly. He is not a reactive breed as some may believe but because of his size many that do not know the Rottweiler may think that he is. In actual fact an aggressive Rotty is generally the result of irresponsible ownership, lack of training, poor or no socialization, neglect, and or abuse. 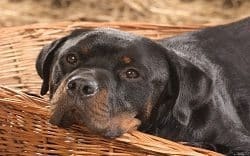 A large, strong breed like the Rottweiler can certainly be a dangerous breed if not properly trained or treated poorly. A Rotty, like any other breed, will develop aggressive tendencies if he feels threatened or worried. These behaviors can create a world of problems for you and your family. If you come to discover that your Rottweiler is aggressive towards you and your family, it is very important to immediately seek help with training. This behavior is a result of poor communication and bad socialization therefore must be dealt with, not ignored. When trained improperly, we can accidentally create a negative temperament in our Rottweilers. It is never a good idea to hit or yell at your Rottweiler when they are disobedient, or during training sessions. Or ever! This only confuses the dog. When you abuse a dog, they become fearful. Fear is the number one cause of aggression. When they get scared, they lash out to defend themselves. You always want to use a reward system when training your dog. This teaches your Rottie good behavior get’s a good reward. And bad behavior should get you no reward. Rottweilers are a territorial breed by nature. It is not uncommon to see a Rottweiler showing guarding behavior towards strangers. He was genetically engineered to watch out for threats remember. A well socialized and carefully trained, properly cared for, Rottweiler may never show guarding behavior but if he does it is vital that it is addressed with positive dog training and behavior modification. Guarding behavior can be a temperamental issue that must be addressed carefully. It is very important to socialize your Rottweiler so they understand the difference between a nice person, expressing friendly behavior, and a potential threat, like a person with a weapon trying to rob or hurt your family. Proper training is needed when you have a Rottweiler because of this possible temperamental behavior. Especially since the Rottweiler has a very important role in your family as protector and companion. It is up to you as the owner of a Rottweiler to train and teach them what is good, positive behavior. They are not going to learn this on their own, they need your guidance to keep them in line. If your Rottweiler is showing signs of aggressive or negative behavior, you must teach them how control their temper. This is not an easy task, but since the Rottweiler is such an obedient and loyal breed, they will most likely do whatever you teach them to do. If you teach them to be aggressive, they will be aggressive. If you teach them to be kind and gentle, they will gladly follow your guidance and just be a love. Always remember that proper exercise is an important part of keeping your Rottweiler’s temperament neutral. They are an excitable breed that has lots of energy. They can suffer from boredom and depression just like we do. If your Rottweiler has plenty of toys to play with, lots of time to run and play, and you give them positive attention, you will have no problem keeping your Rottweiler’s temperament under control. I have had Rottweiler’s my entire adult life, Boston is my wife’s first and they are inseperable! She absolutely loves this Breed! As do I!! Thanks for stopping by Bryan! Yeah, i’m in the same situation. Been around Rotties for 10 years or so. My wife was a bit sceptical at first, but now both she and my son can’t imagine a life without him.